Bringing Your Furniture Back to Life. For over 20 years, Divine Divans & Born Again Furniture has been providing high-quality fabrics and furniture covers to the Minocqua area. We sell fabrics and create custom designs for upholstery, pillows, cushions, slipcovers and more. We offer a huge selection of fabrics, specializing in antique upholstery. At Divine Divans & Born Again Furniture, upholstery isn’t simply a hobby. Owner Angela Calvert holds a degree in upholstery and offers extensive experience in the industry. We offer a full line of services, including re-covering furniture, chairs and cushions, furniture repair, boat seat re-upholstery, custom flip covers and more. We work with multiple manufacturers to ensure we meet the exact pattern our clients desire. Our services are available by appointment, and we work with residential and commercial properties, including resorts. Home and business owners alike know we’re the go-to upholstery shop in Minocqua, WI. We work with leading manufacturers and brands. 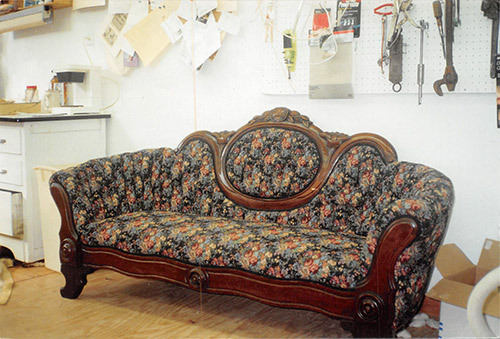 The shop owner holds a degree in upholstery from Milwaukee Area Technical College. Contact the upholstery professionals at Divine Divans & Born Again Furniture to refresh, restyle and renew your furniture today.